Diber's "Black River", Drini i Zini, was named after the crimson tinge it aquired over the centuries when the county was famed for its people's resistance to the Turks. Today the region is divided by the Albanian-Macedonian border (a demarcation put in place in 1913).?? Diber has interesting places to visit, such as the 7 lakes of Lure. The Drin valley is peasant, with several hills and valleys meeting each other. The region is important in Albanian history as the location of Kastriot, where the country's national hero, Gjergj Kastrioti Skanderberg, was born.?? Diber consists of the Bulqize, Diber, and Mat districts. The capital Peshkopi is 20 kilometers from the Macedonian border, and has a small population of about 14,000 residents. It has many quaint Ottoman-style houses. A few kilometres to its east are the famous sulphur baths of Llixhat. 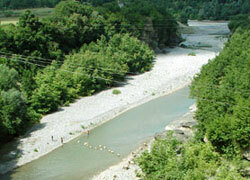 Peshkopi also has other natural attractions, like the National Park and the seven glacial lakes of Lura.